This is the view from my shop. This is what I see when I look up from whatever I’m working on. Whenever I think this house is falling apart faster than I can fix it, whenever I despair that there’s so much wrong with it that I’ll never get it all done, this is a wonderful reminder of why we moved here and why we live here. Today is the 2nd anniversary of when we bought the house, and as much of a challenge as it’s been, I have loved every day of it. 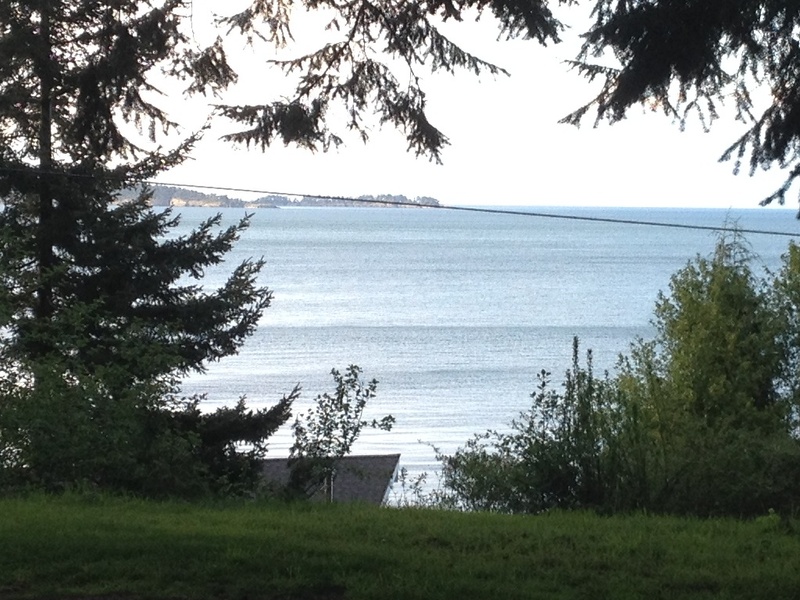 So yeah, with a view like that, it’s no mystery that I like to spend a little time working on the shop itself. It’s my base; it’s where I go to repair old work or create new things, and practice my craft. Here, all things are possible. Here, there is nothing I can’t do. 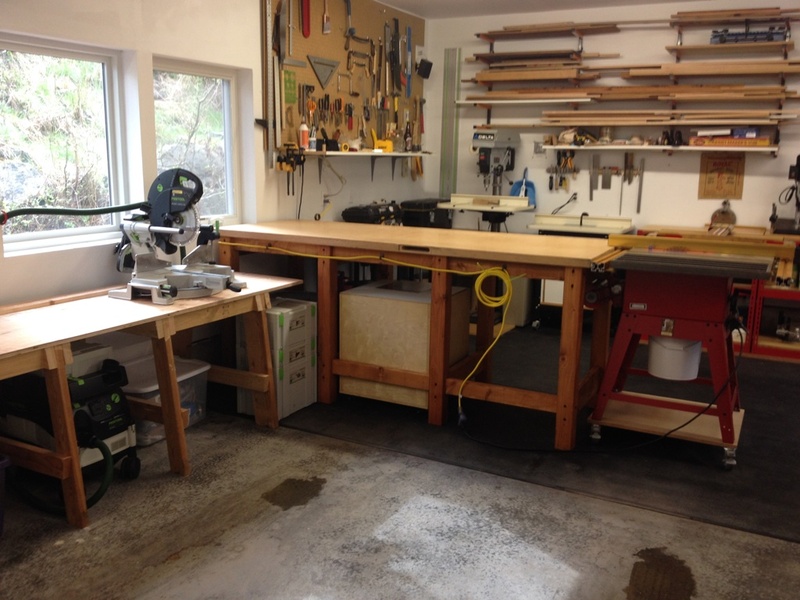 It makes sense to me that I want my shop as good as it can get. 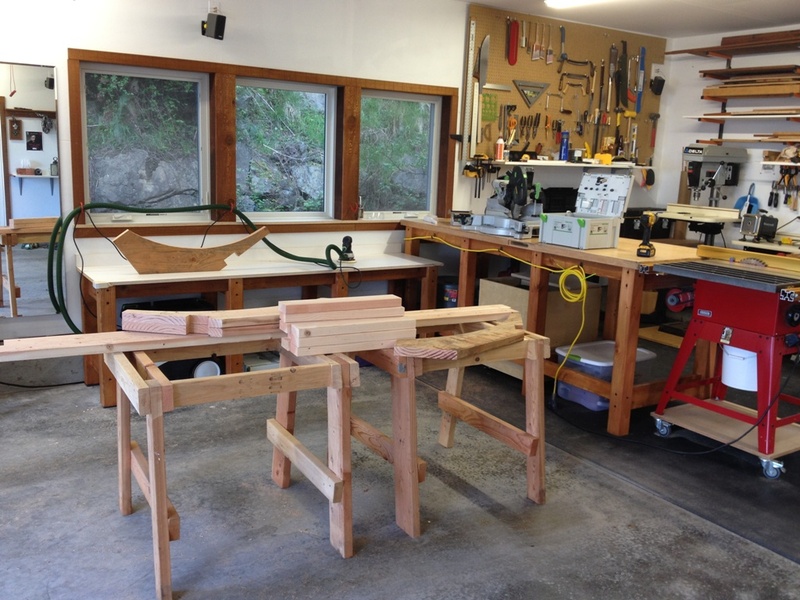 That bench used to be on some old sawhorses I made two hundred years ago. 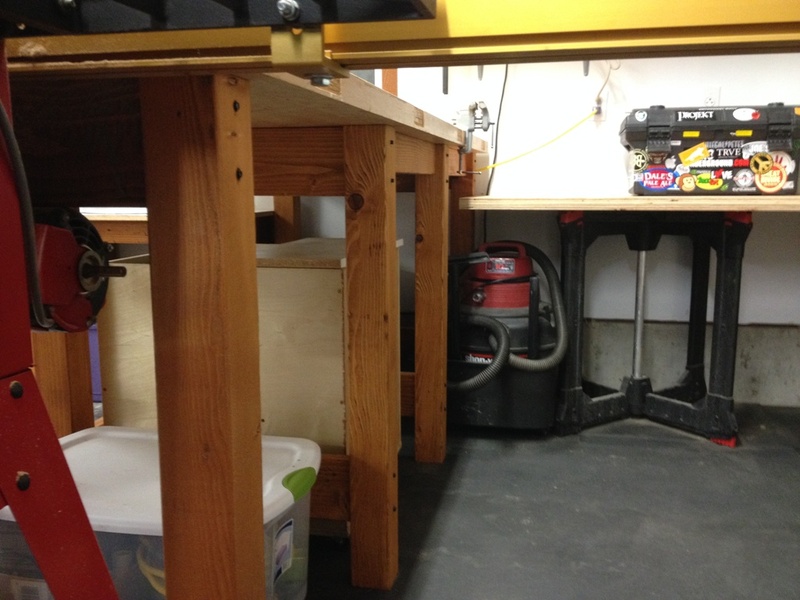 They were sturdy enough, but I like a bench that is the exact same height as the table saw. 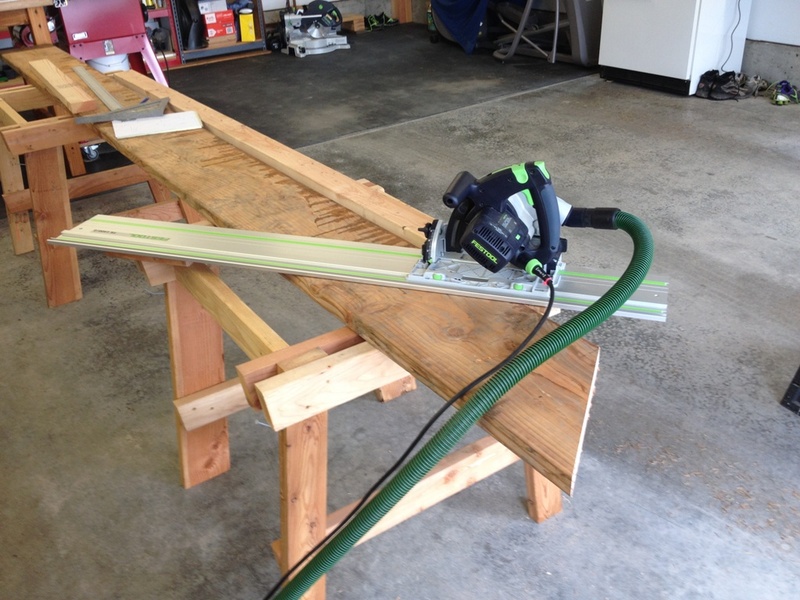 This way, when I cut lumber on the saw it can just slide onto the table. That’s called a Return Feed Table. I’m happy that I have enough space for a big one like that. Plus, I can now work on things without my lower back complaining from bending over all day. Two years later, and I still have about 500 board feet of construction lumber up at the shed. Some of it is exposed to the weather and it’s getting mossy and green, which I actually don’t mind. I like the weathered look. Today I decided to take down some 2×12’s and make them into brackets for a side table next to my bench. Not only will this thing be nice and sturdy, but the brackets keep any table legs out of the way so I can keep things under it, and I can also clean back there a lot easier. I really need to cut these as accurately as I can. 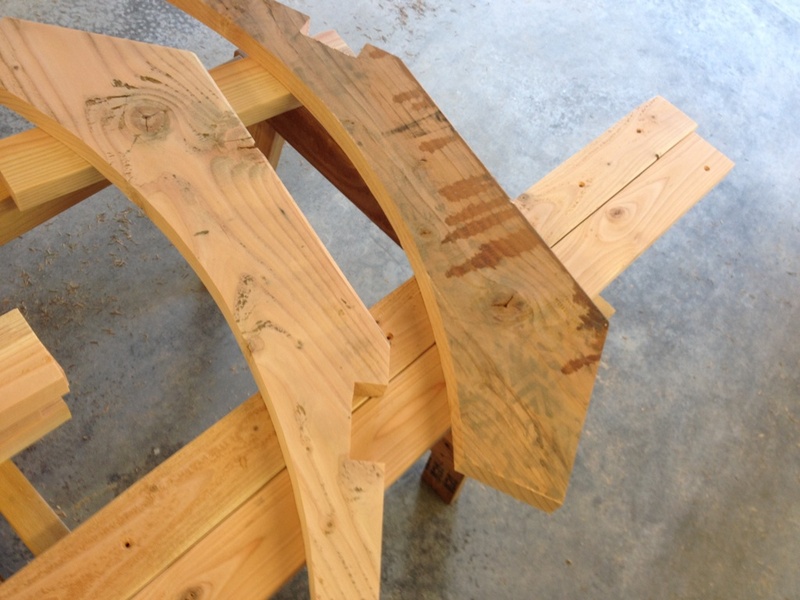 There’s two angled cuts there, and if they don’t make a precise 90 degree angle the table is not going to be flat. I want my tables flat. It’s the least I can ask of them. 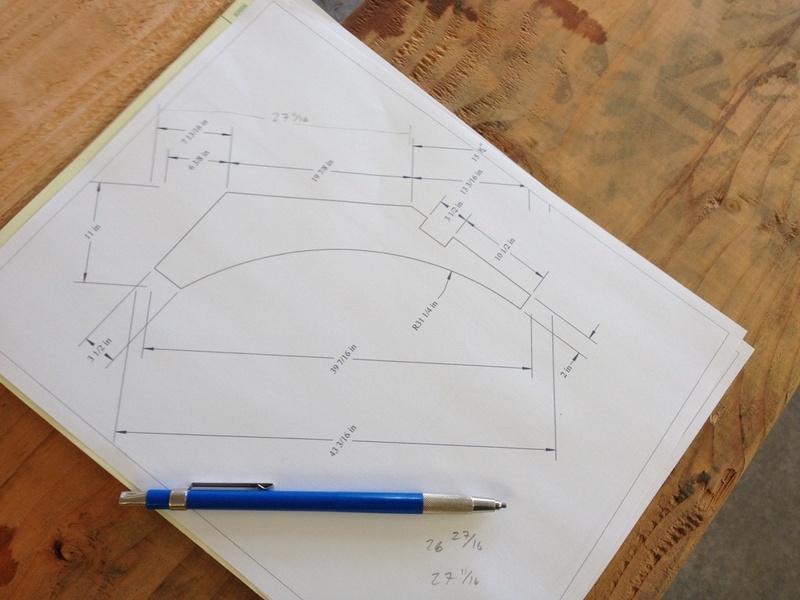 Working with construction lumber can be like measuring with a micrometer, marking with chalk and cutting with an axe. No matter how careful you are, the wood is a little bowed and knotty and not all the same thickness and the sides aren’t even really straight. Yeah, I could put it all through the planer, but what’s the fun in that? Now, here is what I really like about weathered wood. The piece on the right is as I found it outside, and on the left is sanded. I don’t sand it perfect, just enough to give it some smoothness and get most of the dirt and mold off it. It comes out looking random and naturally distressed. And it’s still a very, very strong beam. So I got all the pieces cut and I think this week I’ll get a coat of finish on it and let it cure for a couple days before I affix it to the wall. The shop is really coming up great, the workflow is good and there’s lots of space to spread out and get things done in there. I’ll be ready to start making some kitchen cabinets real soon. I’ve also added a lot of trim and shelves and hooks in the garage. I’m just using rough cedar and leftover T-111 boards for the trim. For a garage, they work great! 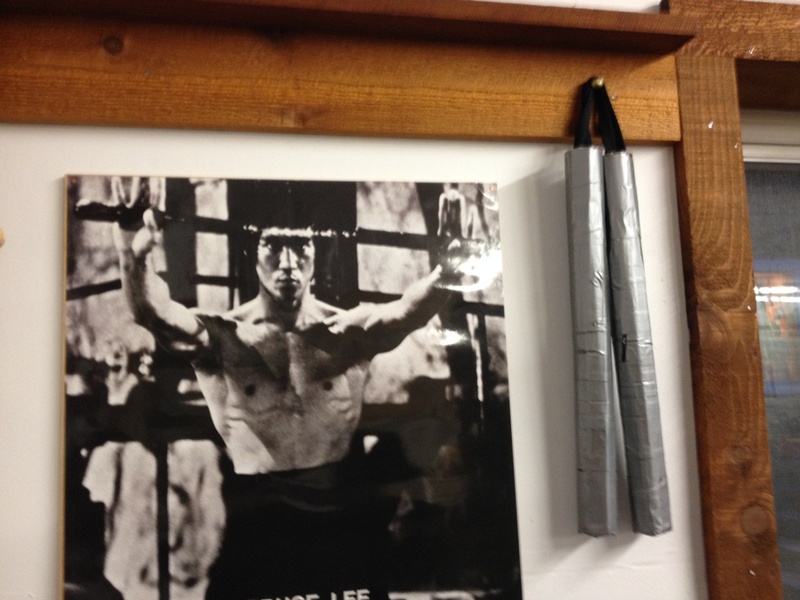 You may have noticed the punching bag that hangs in the corner from previous pictures. It’s not just for looks. About once a week, or every other week, I’m using it for a workout. I spend some of the toughest 48 minutes of my life in front of that bag. We use our garage for a lot of things. I think it’s worth it to fix it up nice. 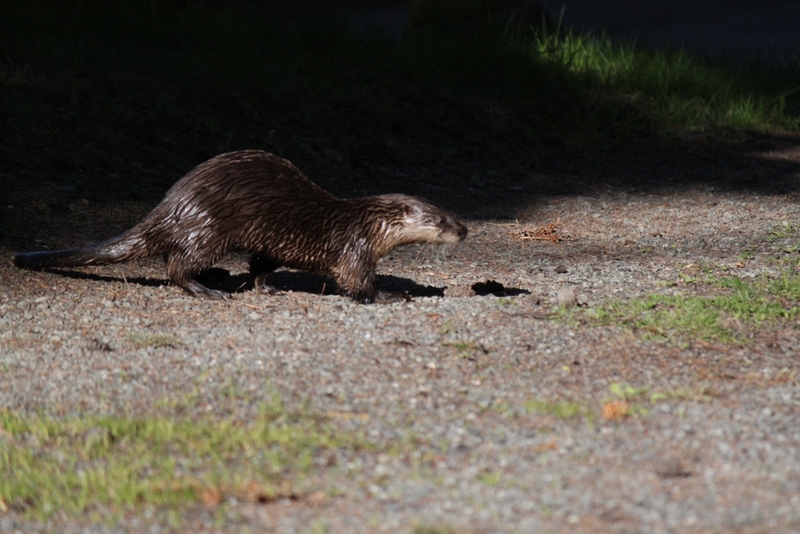 Finally got a pic of this little critter coming up the driveway. He and another one just like him have been passing through periodically, on the way up from the beach and disappearing into the mountainside behind us. Not sure what they’re going up there for. Could be fresh water. Could be an otter sports bar where they watch otter playoff hockey. No idea. I’m guessing they’re sea otters as I’ve seen them frolicking out in the salt water. 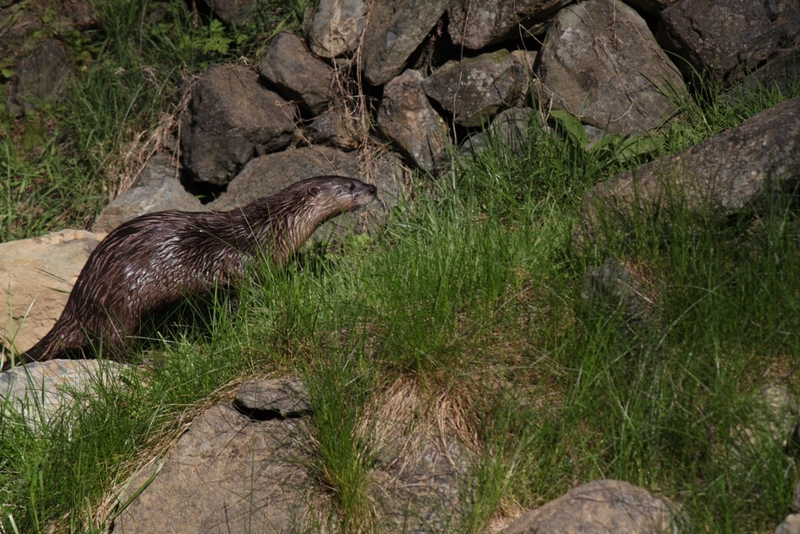 But they could be regular otters. I’m not an otterologist. They are not shy, either. 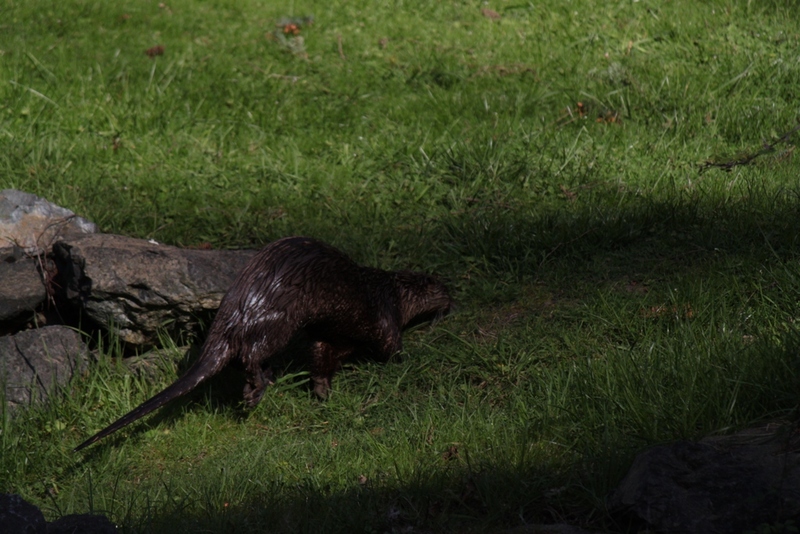 They’ll walk right past you, intent on their little otter destination. And if you have a fish in your pocket they’ll probably chase you. And look at that tail! That thing looks like a weapon.